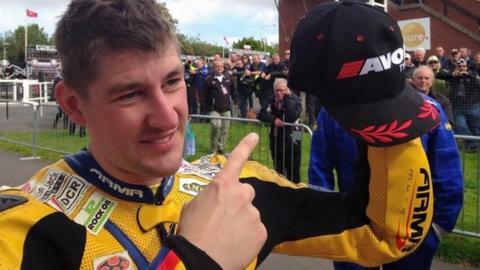 Rob Hodson set lap and race records to claim a commanding victory in the SuperTwin Manx Grand Prix race. The 28-year-old from Wigan led from start to finish and ended the four-lap race one minute ahead of Andrew Dudgeon with Nick Jefferies third. Hodson said: "It feels amazing to win. The conditions were near perfect out there and I'm made up for everyone involved." Meanwhile, Welsh newcomer Mark Purslow won the Lightweight race. The debutant from Bethania finished 21.8 seconds ahead of Solihull's Dan Hobson with Alex Sinclair third.